It was during this walk that Sir James, who was at the time Prime Minister, and Opposition Leader Ralph Gonsalves came to an agreement which allowed calm to return to what was becoming a volatile situation in St. Vincent and the Grenadines. Gonsalves recalled that Sir James was in a âfoul moodâ during their discussion. Gonsalves said on a programme on STAR FM on Thursday, February 24, 2011, that he, civil society leaders and members of the Organization in Defence of Democracy (ODD) were in Grenada attending a meeting brokered by the Organization of Eastern Caribbean States (OECS), to settle the impasse which had developed in St.Vincent and the Grenadines, when Sir James invited him to take a walk on the beach. âHe curse civil servants, he curse teachers, police. He curse the nurses,â said Gonsalves. He said Sir James even kicked the sand. Gonsalves told radio host Seon Marshall it is for this reason he is able to say that what happened in Egypt recently, took place in St.Vincent and the Grenadines in 2000. Gonsalves noted that at the meeting in Grenada, Sir James proposed that they go to the polls in 18 months time, but he, Gonsalves, rejected that plan. The Prime Minister said, thinking in practical terms as well as politics, he responded by suggesting December 2000, but the then Prime Minister said May 16, 2001, instead. Gonsalves stressed that he rejected that date because it was Sir Jamesâ birthday and he would have bragged that he had tricked him. Gonsalves told the nation that the date of March 31, 2001 was later suggested by Sir James, but he (Gonsalves) decided to consult with the Organization in Defense of Democracy (ODD) before agreeing to it. Gonsalves said getting the ODD to agree to that date was not easy, and he had to seek the assistance of Rosie Douglas of Dominica and Kenny Anthony of St.Lucia to get ODD to settle on the date. The main points of the agreement were that elections would be held no later than March 31, 2001, that all street protests would cease and normalcy would be restored in the country. The agreement was signed by Sir James, Gonsalves, Jeffrey Providence, president of the Chamber of Industry and Commerce; Fitz Jones, chairman of the ODD; Dr Denzil Douglas, chairman of CARICOM; St. Clair Leacock, president of the Employers Federation; Dr. Keith Mitchell, Prime Minister of Grenada and Israel Bruce, president of the National Youth Council. 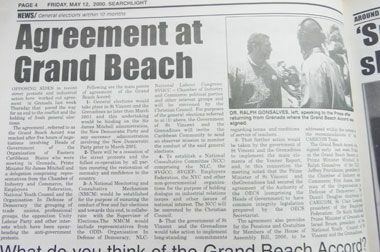 Gonsalves said after signing the agreement, which became known as the Grand Beach Accord, he told Sir James that March 31 is the birthday of his mother, Theresa Francis. Gonsalves stated that he did not make a deal with Sir James, contrary to what people may say. He said incidentally, before he travelled to Grenada with the ODD, he had received information from Carolyn Popovic, a European journalist who operated in St.Lucia/Martinique, that Sir James had almost thrown her out of the VIP lounge at the E.T.Joshua Airport. Gonsalves said at that point he wondered what Sir James was doing there, but Popovic informed him that Sir James was on his way to the OECS summit in Grenada. Gonsalves said this was despite an announcement by the National Broadcasting Corporation (NBC) that Sir James would not be attending that meeting. Gonsalves said he immediately told the leaders of the ULP to close off their protest in Kingstown and prepare to stage a more intense protest the following day, so â… that when Mitchell wakes up [in Grenada] at 6:00, 6:30, Commissioner Quow would tell him that itâs tighter than ever and the forces are larger than ever. So I say that is what he has to go into the meeting with. I said and once that happens, we will be invited to come to Grenada,â Gonsalves recalled. Gonsalves said leaders must be able to reasonably predict what is going to happen. He said following the large protest, he was contacted by the then Deputy Prime Minister Arnhim Eustace to travel to Grenada, along with one or two other persons on a nine-seater flight. âI told him nah, nah, nah. I say you ainât telling me who I taking to a meeting. I say you canât control the streets coming to Kingstown. Is the airspace you want to control?â Gonsalves said he replied. He said when the team got to Grenada, in a meeting co-chaired by former Grenadian Prime Minister Keith Mitchell, the former Prime Minister asked him why he (Gonsalves) was not speaking. He said he replied that he was only there for one thing, to know the date for General Elections and until the discussion centred on that, he had nothing to say. Gonsalves said he was asked a philosophical question by Lester Bird, former Prime Minister of Antigua and Barbuda, what right do people have to challenge a Government, to cut short the term, and he gave him a philosophical answer. Gonsalves said after the discussion went to and fro for a while, Sir James invited him to go outside and settle on the date. Gonsalves said there was applause all around. Sir James declined to sit in the hotelâs dining room, but decided to go on the beach instead. Searchlight made repeated calls to Sir James for his take on the events. We were unsuccessful. Sir James does not mention what happened on the beach in his autobiography âBeyond the Islandsâ.